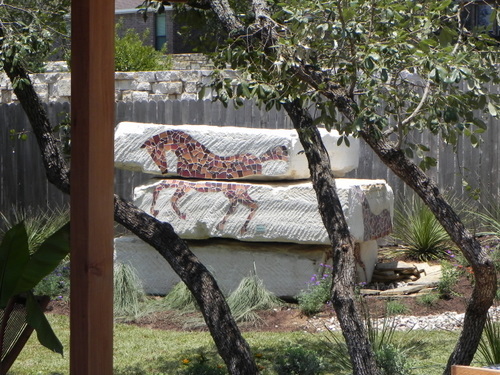 The homeowners were horse lovers and a focal point was constructed in the corner of the yard with massive limestone blocks and engraved with horse mosaics. Typical of HGTV, the project was a massive undertaking and took a team of probably 30 people 5 days to build. This is not to mention that every day was over 100 degrees. For our role, we built the deck, which was surfaced with a high-end composite decking from Fiberon called Horizon Ipe. The deck we build has 2 levels and wrapped around the corner of the house. Stairs were added on one side for access from the yard entrance, and curved steps going up to the deck surface from the back door. We started day-1, had 2 crews working and finished the deck on day three. The project was built in June and the show aired in October. The program was very fast paced and what you missed in editing is the complete chaos of having that many people working in a backyard doing that many different things, pretty cool. Collectively we took a yard with nothing and converted into a fabulous space with some of everything. It’s really impossible to capture all the features of this yard in a single photograph so try to mentally patch them all together. The homeowners certainly benefited the most but the neighbors had fun too, setting up chairs and coolers on the front porch watching everything and everyone come and go. This was certainly a memorable event for everyone involved. Enjoy this slideshow to see more of this finished project. This entry was posted on December 15, 2011 by austinporchandpatio. It was filed under As seen in, HGTV'd . Very hip, organic project. I would be proud to have this in my backyard.